Now, I'm a girl who loves false eyelashes, I can't wear them everyday of course but I do like to whack on a pair if I'm going out or just want to look a bit glam. I recently won a blogger giveaway and as part of the prize there was two sets of false eyelashes from the brand Kiss. I'll be honest I've never heard of the brand before but I had a look online and saw that Boot's sells Kiss false eyelashes for around £4.49. I went to my dear friend Emma's wedding and thought that this would be a perfect time to try out these beauties. The KFL08C ones are far more glamorous than my other pair (KFL03C) and knowing that this wedding would be an ultra-glamorous event I thought these would be perfect. Usually I wear the Eyelure Girl's Aloud Kimberley lashes, I love the way they taper out at the edges but I really wanted to give these a go. I'll be honest, I'm super impressed with the Kiss false eyelashes, they're incredibly lightweight and you can't really tell that you have them on. I like that the individual lashes are rather thin and taper in at the end of each one to make them look at little more natural, though the length definitely shows that they are false. The Kiss eyelashes lasted such a long time on, I put them on at 9AM and didn't take them off until 9AM the next morning. I know it's naughty that I slept in them but I was incredibly drunk and as soon as my head hit the pillow I was asleep within seconds. But these things stayed put, no lifting at the edges, no need to add extra glue they looked great the entire night and I completely forgot I was even wearing them. Oh yes, I have been converted, I absolutely love these eyelashes and can't wait to try out the KFL03C Kiss false eyelashes that I have. I think the price is a bargain for the quality of these eyelashes, I really am so impressed and I know that I'll wear them several more times until I have to buy some more. 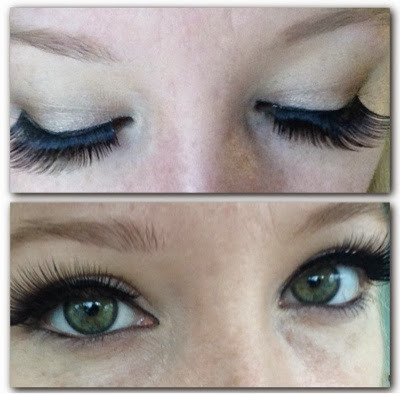 Have you tried out the Kiss false eyelashes before? If so which ones are your favourite?